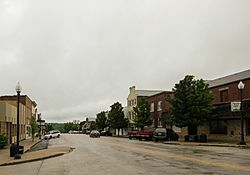 Warrenton had its start in the 1830s as a planned community which was to hold the county seat. The community took its name from Warren County. A post office called Warrenton has been in operation since 1836. The Ernst Schowengerdt House and Warren County Courthouse and Circuit Court Building are listed on the National Register of Historic Places. Warrenton is located at (38.815951, -91.140164). According to the United States Census Bureau, the city has a total area of 8.46 square miles (21.91 km2), of which, 8.37 square miles (21.68 km2) is land and 0.09 square miles (0.23 km2) is water. As of the census of 2010, there were 7,880 people, 2,927 households, and 1,969 families residing in the city. The population density was 941.5 inhabitants per square mile (363.5/km2). There were 3,196 housing units at an average density of 381.8 per square mile (147.4/km2). The racial makeup of the city was 93.9% White, 2.1% African American, 0.6% Native American, 0.7% Asian, 0.1% Pacific Islander, 0.9% from other races, and 1.8% from two or more races. Hispanic or Latino of any race were 3.7% of the population. There were 2,927 households of which 39.6% had children under the age of 18 living with them, 47.0% were married couples living together, 15.1% had a female householder with no husband present, 5.2% had a male householder with no wife present, and 32.7% were non-families. 27.1% of all households were made up of individuals and 12.5% had someone living alone who was 65 years of age or older. The average household size was 2.61 and the average family size was 3.17. The median age in the city was 32.4 years. 29.1% of residents were under the age of 18; 8.8% were between the ages of 18 and 24; 28.2% were from 25 to 44; 21.1% were from 45 to 64; and 12.8% were 65 years of age or older. The gender makeup of the city was 47.9% male and 52.1% female. As of the census of 2000, there were 5,281 people, 1,985 households, and 1,363 families residing in the city. The population density was 720.6 people per square mile (278.2/km²). There were 2,110 housing units at an average density of 287.9 per square mile (111.1/km²). The racial makeup of the city was 95.64% White, 1.70% African American, 0.42% Native American, 0.38% Asian, 0.04% Pacific Islander, 0.57% from other races, and 1.25% from two or more races. Hispanic or Latino of any race were 1.29% of the population. There were 1,985 households out of which 37.9% had children under the age of 18 living with them, 50.8% were married couples living together, 13.6% had a female householder with no husband present, and 31.3% were non-families. 26.5% of all households were made up of individuals and 10.9% had someone living alone who was 65 years of age or older. The average household size was 2.59 and the average family size was 3.14. In the city, the population was spread out with 30.0% under the age of 18, 9.4% from 18 to 24, 30.3% from 25 to 44, 16.8% from 45 to 64, and 13.6% who were 65 years of age or older. The median age was 32 years. For every 100 females there were 88.4 males. For every 100 females age 18 and over, there were 85.7 males. The median income for a household in the city was $53.742, and the median income for a family was $68.740. Males had a median income of $36,809 versus $22,662 for females. The per capita income for the city was $16,431. About 8.0% of families and 10.6% of the population were below the poverty line, including 11.4% of those under age 18 and 15.1% of those age 65 or over. 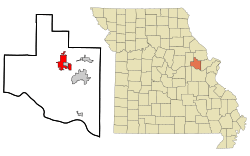 Warrenton, Missouri Facts for Kids. Kiddle Encyclopedia.